Disclosure: I was compensated for this post. Opinions expressed are my own. My Wonderful Walls has teamed up with 11 of their favourite Etsy sellers across North America and the UK to giveaway a fantastic prize package of 12 handcrafted items! 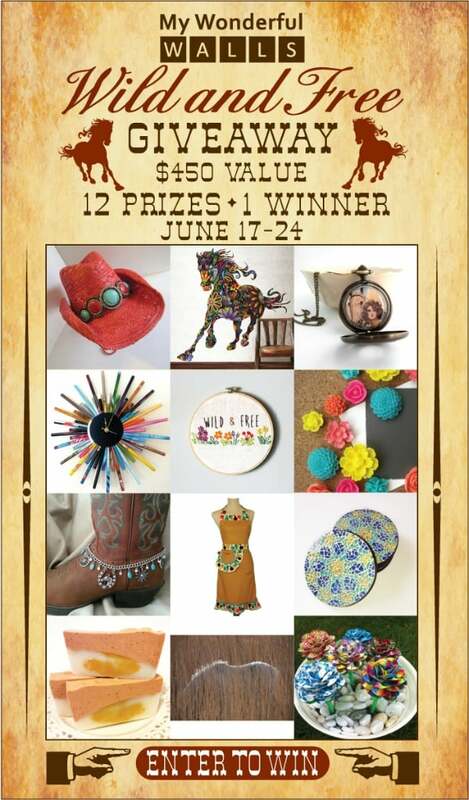 The Wild and Free Giveaway features everything from home decor, jewelry, fashion and more. One winner will take ALL! This prize package is valued at $450. The giveaway ends on June 24, 2014 at midnight PST and is open to USA, Canada, Australia, New Zealand and all European Union countries (age 18+). What I love about this prize pack is that all the products are handcrafted and unique. It’s truly a one-of-a-kind prize! Make sure you visit My Wonderful Walls to enter via the Rafflecopter widget. Best of luck everyone! My Wonderful Walls is also having a sale starting on June 20th and running until June 23 at midnight PST. Save 20% on all regular priced items at MyWonderfulWalls.com. No coupon code required! My Wonderful Walls has a variety of home decor products to transform an ordinary room into something amazing! They have wall stencil kits, wall decals, paint, brushes and more. Instantly change the look and feel of a room with little effort. Their wall decals are made with a special SafeCling™ fabric which is repositionable, layers easily, leaves no residue, and is so thin and detailed it looks hand-painted on the wall. You’ll also find art from Dean Russo, Laura González and Hollie Chastain. Check their Newest Arrivals page often for new additions to the collection. I was browsing through their site and picked out a few of my favourites to share with you: Spring Love Tree Wall Mural Sticker Kit, Night Owl Wall Stickers, Abyssinian Cat Wall Sticker Decal, and Serenity Blossom Dahlia Wall Sticker. Cute right? Have a peek on their site and find something you love too. Thanks Stacie! Glad you liked what you saw on our site. Hope we’ll see some of your readers entering this wonderful giveaway and supporting small businesses who love handcrafted like we do! I would love to win! thanks for the chance to win! Love the wall decals and stickers. A great, easy way to add interest and color to a room. You can really brighten a kids room and make it fun then change it when they get older. I love My Wonderful Walls. I’ve used their decals before, and they are amazing. It’s a nice alternative when you are renting and can’t paint your walls. Just entered! I love MWW and am so sad that we can’t bring ours with us to the new house (already moved them from one room to another and all around so it’s time to buy more).